Lubrication-equipment manufacturer Industrial Innovations, Wyoming, MI, has introduced its new generation of Spra-Rite lubricant proportional-mixing machines (Pro-Mix). Stampers can use the Pro-Mix machines to blend synthetic, semi-synthetic and emulsified lubricants at multiple dilution ratios. The machines feature a new controls package that can run single or multiple machines and distribute at pressures as high as 500 psi, making them a good solution for mixing and delivering high-viscosity lubricants. A new operator touchscreen and in-depth maintenance notification system built into the HMI make this a comprehensive and user-friendly system. 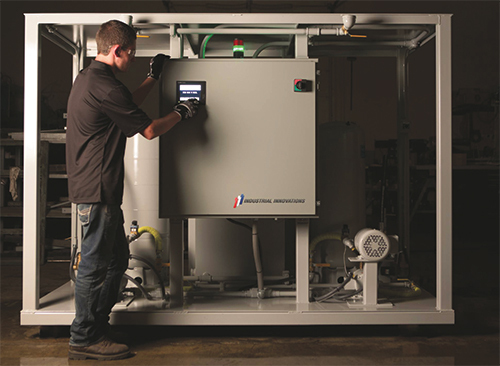 Pro-Mix systems can be connected to a network of piping to automatically deliver a continuous supply of pressurized lubricant mixtures to multiple presses. The systems feature stainless-steel reservoirs for stabilizing liquids prior to mixing and a patented Pro-Drive assembly for thorough mixing, control and pressurizing of the lubricant mixture. Additionally, fluid-level status indicators continuously monitor the level of the two fluids, and refill on demand or discontinue service if levels reach a low level during operation. As in previous generations, the machines come in three models, all with an operator lockout feature that ensures mixture ratios are set for consistency without modification.